Barber Shop Chronicles tickets at Roundhouse, London. 2019. 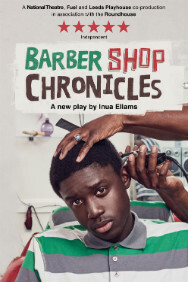 Find the best Barber Shop Chronicles play tickets at Roundhouse, West End. Fuel has produced Ellams' work for theatre since his debut play 9 years ago and this show is the culmination of his travels around Africa and the UK. Barber Shop Chronicles is a heart-warming and insightful new play, set in barber shops in Johannesburg, Harare, Kampala, Lagos, Accra and London. Performers Emmanuel Ighodaro (Tokunbo/Paul/Simphiwe), David Webber (Abram/Ohene/Sizwe), Maynard Ezxiashi (Musa/Andile/Mensah), Anthony Ofoegbu (Emmanuel), Tobi Bamtefa (Kwame/Fabrice/Brian), Jo Servi (Elnathan/Other Roles), Rudolphe Mdlongwa (Tanaka/Fifi), Ade Dee Haastrup (Olawale/Wole/Kwabena/Simon), Michael Balogan (Winston/Shoni), Demmy Ladipo (Wallace/Timothy/Mohammed/Tinashe), Mohammed Mansaray (Samuel), Elander Moore (Ethan). Author Inua Ellams. Producer National Theatre. Producer Leeds Playhoude. Company Fuel. Director Bijan Sheibani. Design Rae Smith. Lighting Jack Knowles. Director Aline David (movement). Sound Gareth Fry. Thursday, 18th July 2019 to Saturday, 24th August 2019. Open 22nd Jul 19. Barber Shop Chronicles tickets: The tabs above allow you to select between links to suppliers and date searching. Click on a supplier's logo to see their details and on the 'buy now' button to see and check the tickets on offer.